AUGUST 4--On the eighth floor of a nursing home in Queens, New York, a 98-year-old woman sits slumped in a wheelchair in the hallway outside her room. She is sleeping, oblivious to the roar coming from the television of her next-door neighbor, who is watching “The Price is Right” at an ear-piercing volume. Though the corridor is uncomfortably toasty on this July morning, the woman has a knitted shawl over her shoulders. She is wearing green sweatpants, a green t-shirt, and black shoes with Velcro closures. The remaining wisps of her hair are gray and tangled. In her clenched left hand is a wad of tissues that she will use to absent-mindedly dab at her face and rheumy eyes. As she naps in the hallway, it is hard to imagine that frail Izola Curry was once a would-be assassin, a woman who nearly changed the course of U.S. history with a seven-inch steel letter opener. For more than half a century, Curry has lived in complete anonymity, despite the fact that she nearly murdered Martin Luther King, Jr. in September 1958, a decade before the civil rights leader was struck down by James Earl Ray at the Lorraine Motel in Memphis. Curry, who pulled the letter opener from her purse, was also carrying a loaded Galesi-Brescia pistol, which was hidden inside her bra. Curry bought the gun a year earlier for $26 in Daytona Beach, but told investigators that she had never taken the weapon outside her home--until September 20, the day she stabbed King. Curry claimed that she had no intention to shoot King, but instead needed the pistol for protection in case the reverend’s followers attacked her. When asked why she placed the gun in her bust and not her handbag, Curry replied, “Suppose I happened to drop the bag and the safety go off and some innocent person is hurt.” Such concern was not evident hours earlier when Curry stabbed King with such force that her letter opener pierced his sternum. As seen above, a photo published on the front page of the New York Daily News showed King with the letter opener sticking out of his upper chest. After subsequently being found “in such a state of insanity” that she could not understand the attempted murder charge lodged against her (and, as a result, was incapable of aiding her defense), Curry was committed to the Matteawan State Hospital for the Criminally Insane in upstate Fishkill, New York. Curry, pictured at left, was 42 when she entered the state Department of Corrections facility. News of her commitment in November 1958--two months after she stabbed King--appeared in various newspapers, including The New York Times, which devoted three paragraphs to the development. It was the last time Curry’s whereabouts, or her condition, would be the subject of press coverage. In the decade between King’s stabbing and his assassination, the civil rights leader would often recall the Harlem attack, noting how close he came to dying that Saturday afternoon in Blumstein’s department store. In fact, during the “Promised Land” speech King delivered in Memphis the day before he was murdered, he referred to Curry. “You know, several years ago, I was in New York City autographing the first book that I had written. And while sitting there autographing books, a demented black woman came up,” King told the Mason Temple audience. “Before I knew it, I had been stabbed by this demented woman. I was rushed to Harlem Hospital. It was a dark Saturday afternoon. That blade had gone through, and the X-rays revealed that the tip of the blade was on the edge of my aorta, the main artery. And once that's punctured, you drowned in your own blood, that's the end of you." King added, "It came out in The New York Times the next morning that if I had merely sneezed, I would have died." 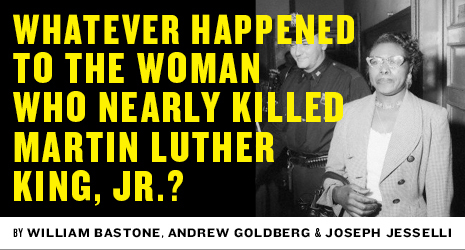 Since first publishing documents about King’s stabbing nearly 17 years ago, The Smoking Gun has intermittently tried to determine what became of the woman who nearly killed the civil rights leader. But checks of various databases and a wide variety of public records--real property, telephone, litigation, auto registration, civil judgments, voter rolls, and driver’s licenses--turned up no trace of Curry (or anyone else named “Izola Curry”). It was not hard to conclude that Curry was deceased. Actuarially speaking, in fact, it seemed likely she had died, perhaps decades earlier. Still, no obituaries or death notices had ever been published for Curry. Also, her name never appeared in the comprehensive death index maintained by the Social Security Administration. After she tried to murder King, Curry disappeared into the state’s corrections/mental health system, apparently never to be heard from again. While again conducting an every-few-years search for Curry, a TSG reporter discovered that an “Izola Curry” had registered to vote from a Queens address three months before the 2012 presidential election. A copy of Curry’s voter application form, obtained from the New York City Board of Elections, includes a Hillside Avenue home address and is stamped “NURSING HOME.” Most importantly, the document also lists the voter’s date of birth as June 14, 1916--identical to that of the “demented black woman” who tried to murder King. Izola Curry, TSG discovered, has been living in Queens for about 40 years. While residing in predominantly African-American communities, she appears to have generated little, if any, notice. Which is understandable, since the details of King’s stabbing--let alone the name of his attacker--are largely lost to history. In fact, most Americans would be unable to name the man who actually succeeded in assassinating the civil rights leader. Curry now resides in the Hillside Manor nursing home in Jamaica (seen below), a no-frills facility with 300 beds on bustling Hillside Avenue. The 98-year-old lives in a small room with a twin bed that looks out onto a rear parking lot. Next to her bed is a walker and a side table that appears to hold the entirety of her possessions--astack of books, a couple of framed photos, and a small pink stuffed animal. During a recent visit, a reporter found a snoozing Curry parked in a wheelchair outside her room at 11 AM. Ten other residents were similarly situated, scattered across the hallway in their wheelchairs. Some were sleeping, all were silent. When the 98-year-old Curry awoke, she greeted a TSG reporter with a smile. “Miss Curry loves to talk,” offered a cheery attendant as she passed in the hallway. During a 30-minute conversation, Curry spoke haltingly and, at times, mumbled answers that were hard to decipher. At one point, she directed her visitor to fetch a chair from her room so that he did not have to stand over her. One of eight children born to sharecroppers in Georgia, Curry said that she has no surviving family members. Wearing an ID bracelet on her wrist, Curry said she entered Hillside Manor a few years ago, after injuring her leg in a fall while living at a private “Family Care” home in Queens. Born Izola Ware, Curry grew up in Adrian, Georgia, a city about 100 miles northwest of Savannah. She left school in the seventh grade and later married a man named James Curry when she was 21. The couple separated about six months after their 1937 nuptials, and Curry moved to New York City, the beginning of an itinerant existence that would see her bounce from Georgia, Florida, St. Louis, and New York while in search of steady work as a housekeeper, short-order cook, or factory worker. According to court records, as well as law enforcement and psychiatric reports, Curry began suffering from delusions, paranoia, and illogical thinking for several years before she sought to kill King. This erratic state appears to have contributed to her difficulties in securing and maintaining employment. Additionally, Curry “believes she has been under constant surveillance and all her movements are known to the NAACP and Dr. King,” according to an October 1958 psychiatric report. The night before King's autograph session at Blumstein's, the civil rights leader addressed a large rally on 125th Street in Harlem that featured remarks from Jackie Robinson, A. Phillip Randolph, New York Governor Averell Harriman, and Nelson Rockefeller, who was challenging Harriman for the governorship. In front of the stage, Duke Ellington conducted his band. Following her arrest, Curry told cops and prosecutors that she had walked by the Friday evening rally en route to a double feature at a Harlem theater (she recalled watching a Tarzan movie and a “native picture”). While denying that she had planned to attack King at the rally, Curry remarked that she could have forced her way through the crowd and “probably I could have got up to him.” Curry was not asked whether she was carrying her gun or letter opener that night. The next afternoon, Curry told investigators, she returned to 125th Street to go “window shopping,” according to a 49-page transcript of her interrogation. She was wearing a smart suit, cat glasses, a necklace, and earrings, and was carrying a large black handbag. It was only after going into Blumstein’s, Curry claimed, that she realized King was signing copies of “Stride Toward Freedom,” his account of the Montgomery, Alabama bus boycott. 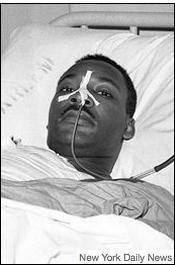 King, with the letter opener in his chest, was transported to Harlem Hospital, where surgeons operated to save his life. Had the weapon been pulled from his chest--as a couple of onlookers at Blumstein’s urged--King would likely have died in the store. Following her police interrogation, Curry was quickly committed for observation at Bellevue Hospital’s psychiatric ward. While “usually cooperative and complacent” on the ward, Curry was prone to getting agitated and excited. “During these episodes, she is very demanding and has at times threatened to effect her escape. Also, it was noted that she has become threatening and assaultive,” according to a psychiatric report. Curry was diagnosed as a paranoid schizophrenic by two psychiatrists who reported that she had an IQ of 70, “low average intelligence,” and was in a severe “state of insanity.” A Manhattan judge would later concur with the psychiatrists’s conclusion that Curry--who had been indicted for attempted murder--should be committed to the Matteawan State Hospital for the Criminally Insane (seen at right). Two months after stabbing King, Curry--described as a “forty-two year old colored female” in hospital records--arrived at Matteawan, where the most famous patient was George Metesky, the “Mad Bomber” who had been arrested and institutionalized the prior year for a 16-year bombing spree across New York City. In an interview with hospital staff, Curry denied that “anybody put her up to” harming King. The stabbing, Curry said, “was entirely her own idea,” according to a Matteawan report. Further details about Curry’s specific course of treatment at Matteawan are unavailable, and access to her case file--now in the custody of the New York State Archives--is restricted due to the state’s Mental Hygiene Law. However, a 1980 letter from the New York State Office of Mental Hygiene provides some general details about Curry’s term at Matteawan. According to the letter, Curry spent nearly 14 years at the upstate New York facility before being transferred in March 1972 to the Manhattan Psychiatric Center on Ward’s Island in upper Manhattan. She spent about a year there before officials placed her in the Rosedale, Queens home of a woman certified through the state’s “Family Care” program to provide residential care for those diagnosed with mental illnesses. Curry remained in the “Family Care” program, apparently residing in at least one other Queens home since Dr. Finger provided an update on her condition. Curry told a TSG reporter she was living in a “Family Care” residence in Queens when she fell and injured her left leg (which prompted her admission to the long-term nursing home where she now lives). At the end of a recent visit, a Hillside Manor attendant approached Curry to let her know that lunch would soon be served. When a reporter asked how she liked the food at the home, Curry remarked that she does not eat much, since she watches her weight. When told that was not often a concern for someone pushing 100, Curry offered her visitor a broad smile. As she began navigating toward the dining room--first by pulling herself along via a handrail on the wall--Curry accepted an offer of a push. But as the dining room neared, she began using her right leg to propel the creaky wheelchair forward.